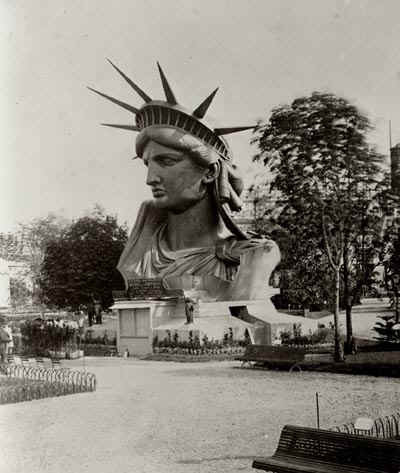 At the Paris Exposition of 1878, the colossal head of Liberty was exhibited and was found to be spacious enough to accommodate forty visitors at a time. "La Liberté Eclairant le Monde," an hymn by the playwright, Emile Guiard, was set to music by Charles Gounod, composer of "Faust," and was sung at the Paris Opera. The refrain, translated, was: "The rays of my torch, piercing the darkness, bring lost ships to safe anchorage and carry my light to the oppressed." With the sanction of the French Government, a lottery was organized for the benefit of the fund. Three hundred thousand tickets were sold at one franc, then worth about twenty cents. Two hundred small terra cotta replicas of the statue were also sold, each signed by Bartholdi and registered at 1000 francs in France and, to cover duty and shipping costs, at $300 in this country. These were almost exact copies of the original "study model" whose height was 1.25 meters. Two bronze copies of the "study model" were sent here and registered in the United States Patent Office in 1876. The Union Franco-Americaine announced in 1880 that the fund was complete. Contributions had been received from 5,000 subscribers, including 181 cities and ten municipal chambers of commerce. The unique task that Bartholdi and his associates had set themselves attracted wide attention: they had no less than 300,000 visitors to their workshop from far and near. Ex-President Grant showed his interest by visiting the shop on his journey around the world in 1877.